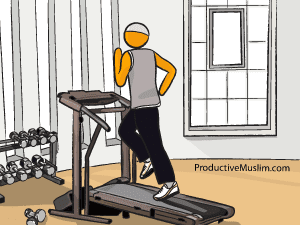 If there is any piece of equipment we at Muslim Fitness would recommend that our brothers and sisters invest in for their “home” workouts, it would be the treadmill. It is non-discriminatory in that people of all ages and any fitness level can use this simple but highly effective machine. The treadmill is versatile, easy to use and the benefits it brings are undeniable. A new study published by the American Heart Association (AHA) journal found that walkers lowered their risk of high blood pressure, high cholesterol and diabetes as much as runners. Unfortunately we often hear comments about how boring it can be. It’s true, using any stationary fitness equipment can definitely become monotonous after a while. Wouldn’t it be nice if we could all afford to buy diverse cardio equipment and turn our home into our own private gym? That would be great! But let’s face it, it’s probably not going to happen anytime soon. So this article is dedicated to anyone who is thinking about using, is using, used and has given up, the treadmill for their cardio workout. Let Muslim Fitness help you renew your enthusiasm and render your monotonous treadmill workouts into an exciting and invigorating total body workout! Make sure you have a bottle of fresh water. Hydration is essential whether you are having a cardio workout or working out using weights. Water is transported to your muscles along with oxygen leaving you feeling energized for the duration of your workout and throughout the entire day. A lack of water will leave you feeling “burned out” and unable to perform as well as you should. Wear adequate footwear such as running shoes or cross trainers. This will improve your performance. There is nothing that irritates us more than seeing someone on the treadmill with improper footwear. This practice causes damage to the articulations, especially the knees, the arch in the foot and lower back to name a few. Wear comfortable clothing that is not too over sized. They will get in the way of your workout and make you overheat. These are optional. You can use 1-pound dumbbells during your treadmill workout to increase intensity. You can pick them up or put them down at any point during the workout. These are not optional! Please use them. Don’t be shy. Swing those arms back and forth. It’ll increase the intensity of your workout and help you push harder when the going gets tough. Not to mention that it’s great for balance. Do not at any given time hold on to your treadmill!!! You’ll be taking all the benefits out of your workout. Brothers and sisters give it all you’ve got. Always take large strides. It’s fabulous for the glutes, hamstrings, thighs, quads and calves. Everyone must adjust the intensity of his/her workout according to his/her personal fitness level. A cardio workout out should leave you out of breath during intense moments and 75% recuperation (comfort in breathing) should be feasible within 1 to 1.5 minutes for maximum benefits. 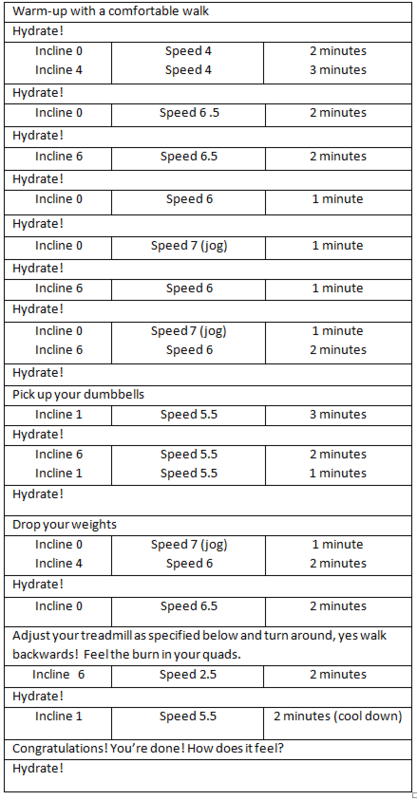 So now you’ve got the essentials for a successful fat burning and energizing treadmill workout. Enjoy! Don’t forget to share your experience in the Comments section below.